Begins with a Table of Contents (ToC) that seems more complete than the ones at the front of each section but is still missing some pieces. "From 1691" but see 1692; no commentary; 7 sections; lyrics begin, "垂老去鄉關，聽泉聲十三年...."
"From 1722"; lyrics (compare #77); combined with other versions? "From Zhang Kongshan"; 19079.10 only 瀟湘雨 Xiao Xiang Yu but in 1682 it is a cipai name. Xiao Xiang Ye Yu is also the name of a cipai and a qin as well as of one of the 8 Views of Xiao and Xiang. "From 1722"; lyrics ("家住吳楚大江頭....") only: they belong not here but with a ruibin version such as the Ao Ai Ge at XXV/561 or the Yu Ge at XXV/578, which have none. "From 1702" but not there! 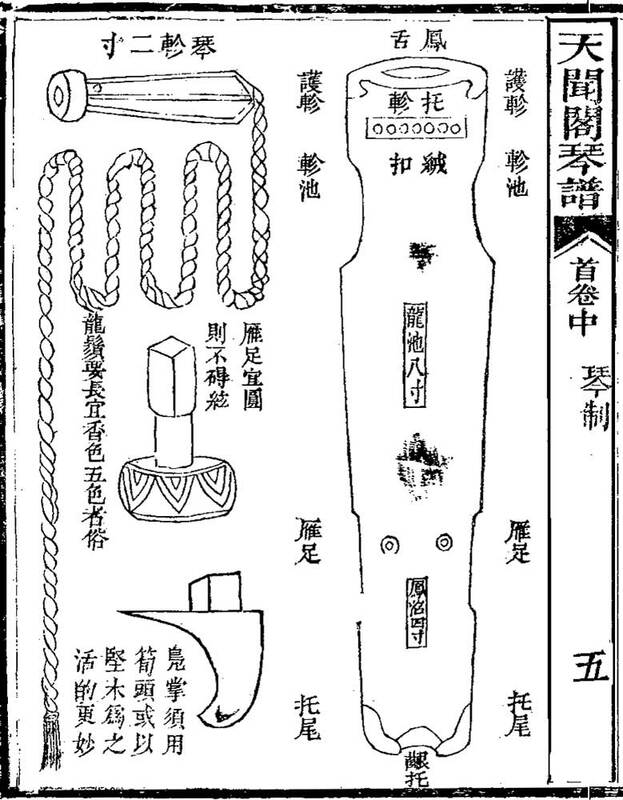 "From 1677"; preface there says, "此曲，非蒼松下，即古梅前撫之，方有雅人之致。程隱庵評。"
"Original lyrics", no music; begins, "天和風日暖。極目晴...". Compare lyrics of 1491, 1625, etc. "From 1705" (XIII/431; that version is the same as 1673), which for some reason calls the mode wu yi; in 1876 the correct tuning is given (raise 2nd and fifth strings), but not the correct tuning name (qiliang), so the placement of the melody here seems to be incorrect. Dragon's whiskers should be long, and it is appropriate to use a yellowish-brown color as it is quite plain within the palette of colors. 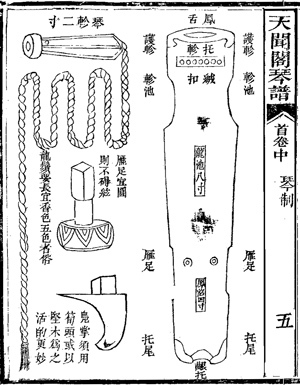 龍鬚 longxu, literally "dragon's whiskers", in this context refer to qin tassels, used for holding and tuning the strings. Do they refer only to the natural tassels, or also to the ornamental additions that seem to be quite popular in some circles? Return to top, or to the Qinpu list.